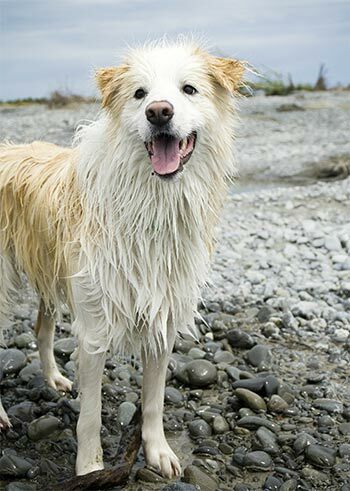 Lead Rusty the red Border Collie dog to water and he's immediately charged with excitement. 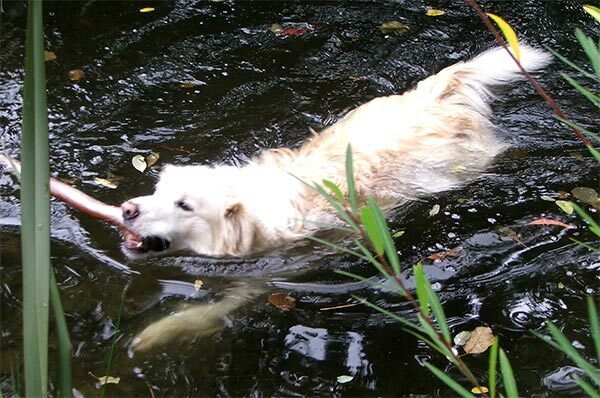 Throw a stick into the water, summer or winter, and splash! Rusty is a four seasons water sports dog. Having a thick insulating coat of pale orange and cream fur must help. Our old dog Taj-Dog wasn't so keen in the winter months. Rusty doesn't care! The Moosey Pond is a major feature in Rusty's home playground. He launches himself off the decking, often watched by two interested cats. Bath time? The pond is Rusty's bath for whenever he gets too smelly or grubby. He does spectacular dog-belly-flops, often spinning in mid-air, and dunking himself completely underneath the water, just to fetch that tennis ball or pinecone. 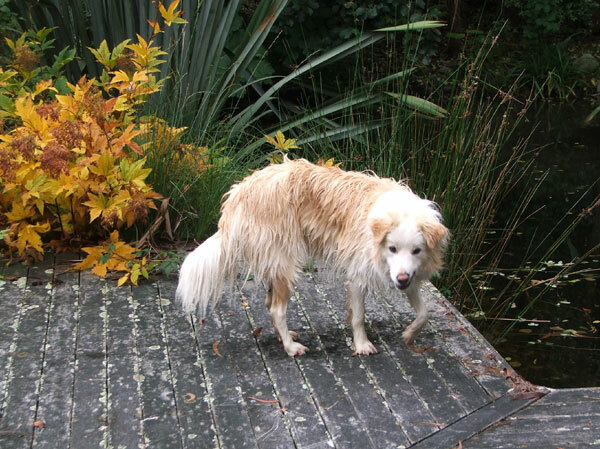 Swimming with Rusty in the pond is interesting - two friends dog-paddling around in circles, one extremely furry. But Rusty loves to swim close to his gardener friend. Ouch! No frolicking in the water race chasing floating tennis balls - here Rusty has a serious job to do. It's officially known as Water Race Duty. He has to guard the downstream water from floating objects - clumps of weeds, stray tree branches, even leaves - whenever his gardener friend is working nearby. He concentrates hard, staring at her weeding hands for hours, just in case any greenery escapes. If it does, he'll retrieve the offending article, deposit it on the lawn and then resume his duties. There is absolutely no truth to the rumour that Moosey occasionally, deliberately, throws weeds into the water, just to keep Rusty dog on his toes. The Moosey pond is Rusty's playground, but the nearby river is Rusty's paradise! 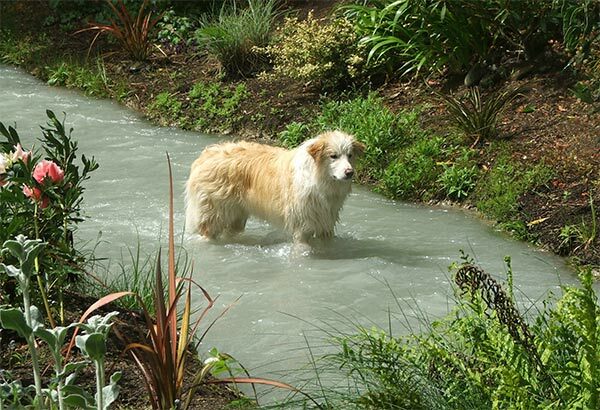 The Waimakariri River is a fast flowering, clear, cold braided river, five minutes away by car, and Rusty adores it. 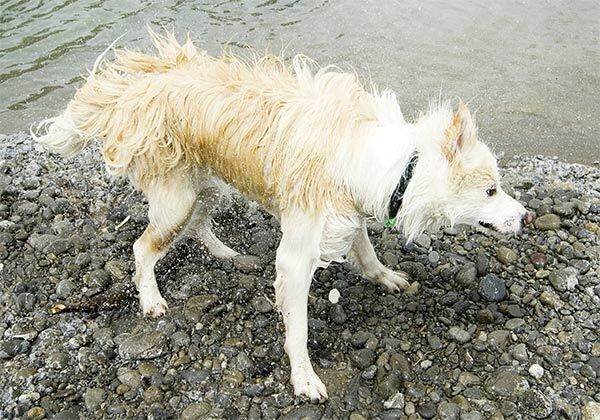 There are rabbits to sniff out and chase in the scrubby banks, and sticks to chase into the fast flowing water. And a dog can't drive himself to the river so there's always at least one of his favourite humans to provide good throwing company. 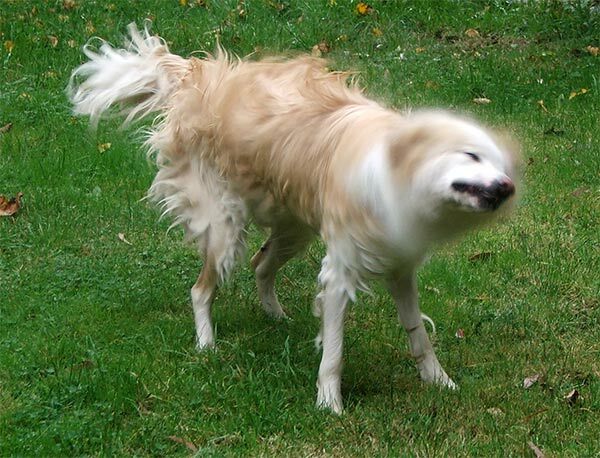 And after the water sports there's the traditional dog-shake-down, usually performed as close to the gardening friend as possible. Then a few zooming circuits of the house lawns and Rusty is almost dry again, while the gardener wimpishly contemplates changing her wet jeans.